MOSCOW, January 29. /TASS/. Washington and its closest allies are openly pursuing a policy aimed at overthrowing the legitimate authorities in Caracas, Russian Foreign Minister Sergey Lavrov said on Tuesday. The decision to exempt American businesses from the sanctions against Venezuela is evidence of Washington’s intention for regime change in that country while at the same time maximizing profit from it, he added. "This merely underscores the cynicism of the current developments. US companies operating in Venezuela are exempt from these sanctions. In other words, they wish to topple the government and derive material gains from this," Lavrov said. "According to our sources, the leaders of the opposition movement who have declared ‘dual power’ are in fact receiving instructions from Washington not to make any concessions until the authorities agree to abdicate in some way," Lavrov said. "Together with other responsible members of the international community, we will do everything to support President Maduro’s legitimate government in upholding the Venezuelan constitution and employing methods to resolve the crisis that are within the constitutional framework," the Russian top diplomat stressed. Lavrov pointed out that during a recent press briefing, US National Security Adviser John Bolton nonchalantly displayed a notepad about sending troops to Colombia that cameras quickly picked up. This raised eyebrows, particularly given Washington’s statements about a potential military intervention in Venezuela. "I have read reports saying that apparently yesterday, John Bolton held a press briefing and, according to the media, was careless enough to expose some notes to journalists with TV and photo cameras. 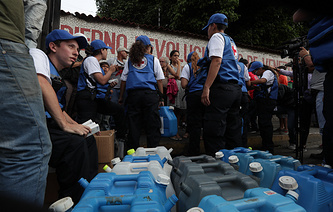 The note read ‘5,000 troops to Colombia.’ This raised some eyebrows, especially given the overt calls for using Venezuela’s neighboring countries to launch a direct intervention due to the difficult humanitarian situation in Venezuela, which can be heard from the United States and a number of other countries," the Russian top diplomat elaborated. The note in question took center stage at Bolton’s press briefing. Many media outlets posted a photo of him holding the notepad with handwritten notes that read "Afghanistan - welcome the talks" and "5,000 troops to Colombia." When asked about a potential US military intervention, a White House spokesperson noted, "As the president has said, all options are on the table." Colombia’s Defense and Foreign Ministries later rejected the reports about a potential deployment of 5,000 US troops to the country. Colombian Foreign Minister Carlos Holmes Trujillo said that Bogota was unaware of any such plans. Moscow has asked the European Union to explain its initiative to resolve the situation in Venezuela, Lavrov said. "We have taken note that although several EU countries presented an ultimatum to [Venezuelan] President Nicolas Maduro, [High Representative of the European Union for Foreign Affairs and Security Policy] Federica Mogherini issued a more moderate statement on behalf of the entire European Union, promoting an idea to set up some contact group," he said. "We have asked our European colleagues what exactly it is all about and how they plan - if they have any plans at all - to translate it into practical action," the Russian top diplomat added. 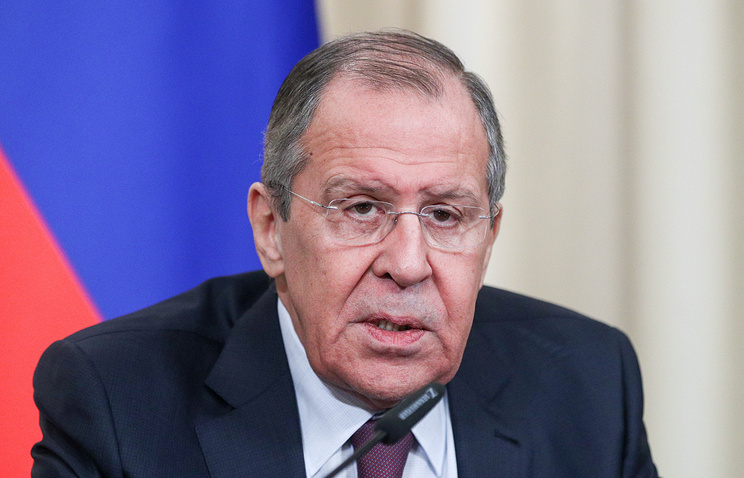 Lavrov noted that members of the Caribbean Community (CARICOM) were particularly concerned about "the plans that some aggressive foreign players have in relation to Venezuela." "They have also shown interest in trying to pave the way for international mediation," he noted, adding that Venezuelan authorities had expressed readiness to hold such talks with the opposition. "Given signals coming from the EU and the interests of the Caribbean countries, as well as the fact that China and India seek to prevent catastrophic developments, we would like to figure out what the international community could do to prevent another blatant violation of international law and violent regime change, and bring the situation back to the constitutional track. This is what I discussed yesterday with the Iranian foreign minister, who - just like us - wants to find an opportunity for external players to prove themselves useful to the Venezuelan people," the Russian foreign minister said. Meanwhile, Spain, France, Germany, the United Kingdom and the Netherlands said on January 26 that they would recognize Guaido as Venezuela’s interim president unless Maduro called elections by February 3.